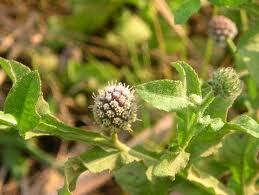 It is aromatic herb usually found in paddy field as a weed. It has ball like reddish flowers. Greying of hair, general body debility. Mix equal quantity of Sphaeranthus Indicus and Eclipta Alba and is given with honey for greying of hair and for general body debility.